The “Blog” of “Unnecessary” Quotation Marks: wait, what? Nope, I bet it's a denture holder. And if they'd stuck the quotes around everything BUT "her" they'd probably have been fine. Choppers can also mean a pair of gloves (to chop wood with) -- slang from our Midwest and (possibly) our northern neighbors. I'm inclined to agree w/ Galadriel, but wouldn't that be "chompers?" Considering it's a jar shaped like an old woman holding a toothbrush and a tube of some unknown "paste," I'd say this is definitely a denture holder. It IS a "chomper" holder, but i tell you Gabe, i "blew" up the pic and i was hard pressed to make out the toothbrush and toothpaste. This looks like it's a bit roomy for one, maybe it's "hers" because hubby puts his in too? eeew! 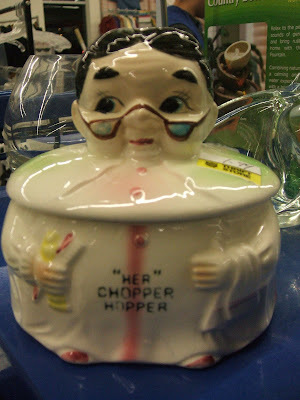 A second-hand denture holder? Ewww! It's for a "bottom." Aka, a "queen." Right?